NEW YORK (AP) — New York's Metropolitan Museum of Art says it's returning a prized artifact to Egypt after learning it was stolen from the country in 2011. NEW YORK (AP) — The Metropolitan Museum of Art in New York City is partnering with a Michelin-starred chef. SAN FRANCISCO (AP) — New York's Metropolitan Museum of Art and the Fine Arts Museums of San Francisco have effectively swapped chief executives. NEW YORK (AP) — A small but elegant exhibit tucked amid the American period rooms on the second floor of the Metropolitan Museum of Art explores the little-known story behind Chippendale furniture, and how one young man's bold idea to create a detailed manifesto about chairs and tables for the British elite transformed his name into an enduring style. ROME (AP) — Italian police said Tuesday they had recovered an 18th-century ebony desk that was illegally taken abroad after World War II and ended up for a time on display in New York's Metropolitan Museum of Art. The desk, made with ivory and mother of pearl inlays, is considered a masterpiece of Pietro Piffetti, one of the most important ebony carpenters of his time. Italy's carabinieri art squad police unit said the desk was believed to be worth more than 2 million euros ($2.3 million). NEW YORK (AP) — Divine designs floated up the red carpet at Monday's religion-themed Met Gala in shimmering golds, reds and fuchsia, in crowns and in crosses, and even a pair of giant wings. NEW YORK (AP) — Tiaras encrusted with thousands of diamonds, emeralds and rubies. Papal cloaks and vestments with golden embroidery so fine they took 16 years to produce. NEW YORK (AP) — The Paris Review has chosen a new editor, Emily Nemens, currently the co-editor of The Southern Review. NEW YORK (AP) — Just in time for spring, a section of the Metropolitan Museum of Art has been transformed into a sort of 19th century palm garden encircled by colorful galleries featuring still lifes, landscapes and other works — complete with Parisian-style signage and park benches — that trace the history of French parks and gardens. NEW YORK (AP) — In a story March 10 about an anti-opioid protest at The Metropolitan Museum of Art, The Associated Press reported erroneously that Purdue Pharma was owned by Arthur, Mortimer and Raymond Sackler. Arthur Sackler died before Purdue Pharma was formed. Montana State University photography professor Ian van Coller's efforts to shine a light on climate change have resulted in a series of art books documenting diminishing glaciers, including one that is on exhibit at New York City's Metropolitan Museum of Art. NEW YORK (AP) — The Metropolitan Museum of Art is partially abandoning its "pay-what-you-wish" admissions policy that has made it an egalitarian destination for generations of art lovers, even those who could barely afford a bus ticket into town. NEW YORK (AP) — The lawmen who knocked on the door of Helen Fioratti's Park Avenue apartment this fall weren't hunting for a fugitive or a stash of drugs. They were after her coffee table. NEW YORK (AP) — New York's Metropolitan Museum of Art has refused to remove a 1938 painting by the artist known as Balthus that depicts a young girl in what some are saying is a sexually suggestive pose. The painting , entitled "Therese Dreaming," shows the girl leaning back with her underwear visible. The late Polish-French artist, born Balthasar Klossowski, is known for his erotically-charged images of pubescent girls. NEW YORK (AP) — A husband and wife from Colorado have dropped their bid to prevent a 2,300-year-old marble bull's head from being returned to the Republic of Lebanon, where New York prosecutors say it had been stolen during the country's civil war in 1981. The sculpture had been on loan to the Metropolitan Museum of Art until July, when Lebanese officials requested the item's return and it was handed over to New York City authorities. LOS ANGELES (AP) — Visitors to Los Angeles' Getty Museum have an opportunity this fall to see a brilliant pen-and-ink drawing by Michelangelo that has been out of public view for centuries. "Study of a Mourning Woman," drawn in the early 1500s, went on display at the Getty Museum on Wednesday. It will remain there until Oct. 29. After that it will be loaned to New York's Metropolitan Museum of Art for a Michelangelo exhibition opening in November. NEW YORK (AP) — An ancient vase that for years was housed in the elegant galleries of the Metropolitan Museum of Art is taking up space in a much different place — a prosecutor's office. NEW YORK (AP) — Bamboo is getting attention these days as a versatile and sustainable material for housewares, so the timing is good for a Metropolitan Museum of Art exhibit that explores Japan's ancient craft of basketry. NEW YORK (AP) — The Metropolitan Museum of Art has announced a change in its leadership structure, appointing current president and chief operating officer Daniel Weiss as the New York City museum's new president and chief executive. BUCHAREST, Romania (AP) — U.S. designer Tory Burch has changed the description of one of her designs, a traditional Romanian-style coat, after her brand angered thousands of Romanians for marketing it as a garment inspired by Africa. The online group La Blouse Roumaine, which promotes traditional costume, showed on Facebook Burch's design next to a virtually identical Romanian one on display in the New York Metropolitan Museum of Art. NEW YORK (AP) — Anyone who has waited on a long, snaking line to get into a fashion exhibit at a top museum knows just how popular they've become — and more broadly, how fashion is increasingly seen as a form of artistic and cultural expression. Google Inc. is acknowledging this reality by expanding its Google Art Project — launched in 2011 to link users with art collections around the world, online — to include fashion. Kanye West reportedly snubbed the Met Gala in response to Kim Kardashian West's holiday antics in Mexico. The 39-year-old musician was a notable absentee from Monday's (05.01.17) fundraising event at the Metropolitan Museum of Art in New York City, with Kanye apparently upset with his wife and her sister Kourtney for damaging their "brand" during an alcohol-fuelled vacation last month. NEW YORK (AP) — If you're someone who likes a lot of guidance and explanation at the museum, you might want to dramatically recalibrate your expectations before heading into "Rei Kawakubo/Comme des Garcons: Art of the In-Between," the lavishly presented new show at the Metropolitan Museum of Art's Costume Institute. NEW YORK (AP) — It's not uncommon to aspire to a perfectly organized closet. But Sara Berman's closet, with its starched and ironed clothes and linens, its stack of soft hats, its jar of buttons and its row of Easy Spirit shoes, all lined up and all in shades of white, ivory or the palest ecru, went far beyond that. 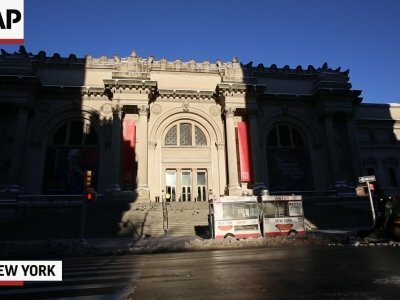 NEW YORK (AP) — Police in New York City are searching for a man who they say assaulted a security guard at a Manhattan museum. Authorities say the man approached a security guard at the Metropolitan Museum of Art on Friday to tell him a painting was crooked. Police say the guard then told the man to bring his concern to the information desk. A Palm Beach painting is selling for $4.8M: Is it a bargain? PALM BEACH, Fla. (AP) — When the Metropolitan Museum of Art purchased Thomas Hart Benton's painting "Roasting Ears" for $3,000 back in 1938, Benton's wife Rita remarked: "Whew, they must have put a beautiful frame around it." Imagine the "whew" she'd let out now. NEW YORK (AP) — The director and chief executive of the Metropolitan Museum of Art has resigned after leading the New York institution for eight years. The New York Times (http://nyti.ms/2mHPJYV ) reports that Thomas Campbell announced his resignation in a letter sent to the museum's board and staff members on Tuesday. In the letter, Campbell said he's stepping down to pursue the next phase of his career. He joined the Met in 1996 as a tapestry specialist. NEW YORK (AP) — World-class art, meet sweaty aerobics. New York City's cavernous Metropolitan Museum of Art has been holding lively morning workout sessions this winter amid its prized masterpieces. The 45-minute "Museum Workout" sends people in exercise attire chugging through 35 galleries, past paintings, sculptures, armor and other treasures, before the venerable Fifth Avenue institution opens to the public. NEW YORK (AP) — The Met Breuer (BROY'-uhr) museum in Manhattan is featuring a career retrospective of figurative painter Kerry James Marshall this month. The Chicago-based, Alabama-born artist depicts the African-American experience. The Met Breuer is the modern and contemporary art outpost of the Metropolitan Museum of Art. More than 80 of Marshall's works go on view on Oct. 25, ranging from the 1980s to the present.